Murrell Belanger loved anything that had a motor in it. His love for speed started in the early 1920s. Before the end of his senior year of high school, he went on the road to race motorcycles, one of the roughest ways to run an oval. After one of his best friends lost his life in a motorcycle accident, Murrell’s mother told him that his motorcycle racing career had to come to an end, which wasn’t a terrible decision to live with because Murrell wanted a race cars anyway. Belanger soon made his paycheck by working for a local Buick dealer and raced when he could, mostly in the old Central Illinois Racing Association. He raced at Roby Speedway and the Crown Point Fairgrounds and just about anywhere he could find a contest. One day though, he went through the fence at the North Shore Polo Grounds and that was the end of Murrell’s race driving career. As he grew older, Murrell learned that there was one thing that he was naturally skilled at, selling. After gathering up as much money as he could, Murrell along with his brother-in-law and some friends went into the automobile business. First they started selling Auburns, Cords, Packards, Chryslers and International Trucks, Always, working, always selling, always looking for business opportunities, that was Murrell Belanger. It wasn’t long before Chrysler came to Belanger, and made it clear that they wanted his auto sales skills exclusively. With that, Belanger Motors was born. In time, Belanger’s business success allowed him to return to his first love; racing. He developed friendships with a whole list of local racers, Emil Andres, Duke Nalon, Paul Russo, Johnny Pawl and Ray Nichels. But his most profitable racing friendship was with a young driver by the name of Melvin Eugene “Tony” Bettenhausen from Tinley Park, Illinois. He purchased his first Indy car in 1934 and for the next 17 years showed up for every Month of May. But to no avail. The Indy Winners Circle eluded his efforts year after year. He came close once in 1940, when Emil Andres finished 12th. But for all the years of toil and trouble, Belanger Racing was unable to cash in. That was until the magical season of 1951. Their success really started in 1950, when Murrell Belanger purchased Kurtis-Kraft Chassis #327-49 from Lou Meyer and Dale Drake, the owners of Meyer and Drake Engineering, the sole suppliers of the Offenhauser (Offy) engine. In 1949, Meyer and Drake (M&D) purchased the car from Frank Kurtis. It was a newly-designed lightweight Kurtis-Kraft chassis with a specially designed super-charged Offy engine. It was labeled the M&D No. 99. M&D, a long-time suppler to Belanger, asked that Frenchy Sirois and Dale “Tiny” Worley (from Lowell) campaign the car as a testing program for the new, smaller and lighter designed racecar. Once the Belanger mechanics got a hold of it, the No. 99 started to run with the leaders. So much so that, other racing teams to begin protesting loudly about the conflict of interest of Meyer & Drake racing their own car against other race teams; M&D’s primary customers. So Murrell Belanger took the No. 99 home to his pristine race car operations located on the second floor of the Belanger Farm Equipment Company on Mill Street in Lowell. There his race team of Sirois, Worley, George Salih, Harold Brownell, Howard Meeker and Ralph Collins, got it ready for the upcoming AAA race season. Their first order of business was to install a standard 270 cubic inch Offy. Then they went racing. And race they did. The end of the 1950 season saw the No. 99 and Tony Bettenhausen go on a roll in October, running the leaders and winning its first race at Springfield. So starting from the middle of the front row, the Belanger No. 99 was driven by 40 year-old Lee Wallard of Altamont, N.Y., who absolutely destroyed the competition. Wallard got out in front and stayed there winning the Memorial Day classic in record time. He and Murrell Belanger cashed in on a record purse of $63,612 and Wallard was awarded a brand new Chrysler convertible pace car. Needless to say, Chrysler Corporation was thrilled that Murrell Belanger one of their most successful car dealers, was Indy 500 winning owner. Unfortunately, a week later while driving another car, Wallard suffered severe burns in a race in Pennsylvania. Tony Bettenhausen went back behind the wheel of No. 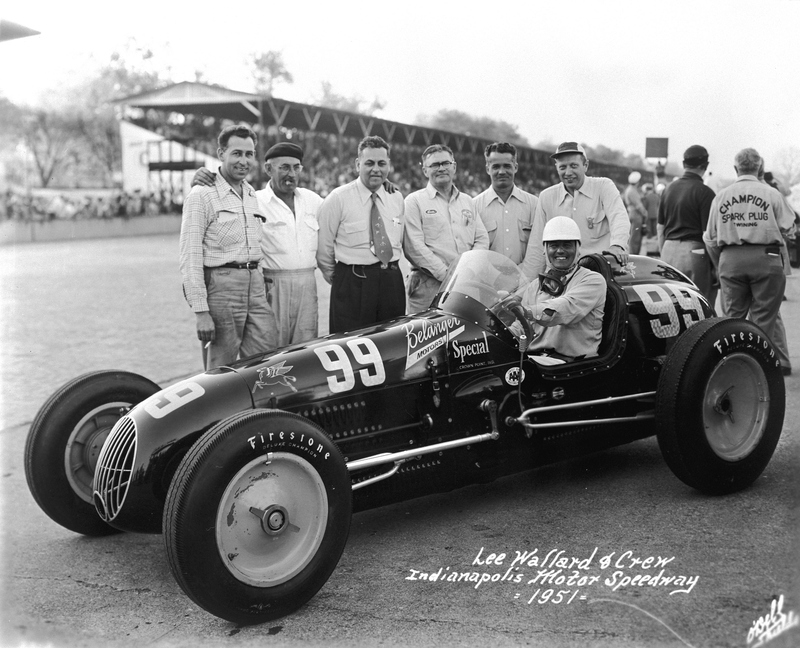 99 for the rest of 1951, and proved to everyone that Indianapolis was no fluke, with Belanger’s team winning nine races of the 14 run in the AAA IndyCar season. When it was all said and done, the Belanger No. 99, won the 1951 Indianapolis 500, the 1951 AAA National Championship and went on to become the winningest Kurtis-Kraft built, Offy-powered race car ever. Its performance is a cornerstone of the racing career of Murrell Belanger. To this day, Belanger is one of the winningest race car owners in all of IndyCar history. Probably the most telling instance of what the Belanger Kurtis-Kraft meant to the racing community, is when that gorgeous dark blue Belanger No. 99, entered the victory circle to collect its place on the Borg-Warner Trophy in the 1951 Indianapolis 500, a youngster from Ohio, sitting alongside his father for his very first Indy 500, made up his mind that he too one day would race at Indianapolis. That youngster’s name was Roger Penske. As for the Murrell Belanger No. 99, it now rests in the Indianapolis Motor Speedway Hall-of-Fame Museum. Four-wide finish in Firestone Freedom 100 — A harbinger of things to come for Indy 500 ?